Baseball can seem slow at first. But once a batter puts the ball into play, every millisecond counts. The difference between a scoring play and an out can be only inches – a slip in the infield dirt when fielding a ball or losing traction while sprinting towards first base can drastically change the course of a game. Every bit of performance as a runner and fielder matters to your team’s success, and having the right pair of cleats can give you the competitive edge that you need to win. Of course, as with most types of footwear, there are a staggering number of options for baseball cleats out there. In this guide, we’ll give you all the information you need to choose the right baseball cleat for you and review 12 of the best baseball cleats – six for men and six for women – on the market right now. Baseball cleats are typically made of either genuine leather or synthetic leather. Genuine leather is considered to be superior since it is more breathable, provides better stretch against the foot, and is more durable. However, it also comes at significantly higher price tag than synthetic leather, which also offers the benefit of increased support and stiffness around the front and middle of the foot. Baseball cleats come in three distinct classes of ankle cuff height – low-, mid-, and high-cut cleats. Low-cut cleats do not provide any material around the ankle, and so do nothing to prevent against ankle injuries, but are ideal for running in a straight line since they are lightweight and offer the greatest range of foot motion. High-cut cleats, on the other hand, may feel clunky and heavy when running but the added structure around your ankle can go a long way towards preventing injury when moving in the field. Mid-cut cleats offer a compromise between the two styles, although buying two pairs of cleats – a low-cut pair for running the bases and a high-cut pair for fielding – offers the best of both worlds for those who can afford it. The cleats on baseball cleats are typically made of either metal or molded plastic. Although turf shoes, cleat-less shoes intended for training on turf fields, are available, they will not be covered in this guide. Metal cleats offer superior traction to plastic cleats, effectively digging into both infield dirt and outfield grass. They also allow players to dig into the dirt in the batter’s box to maintain a steady stance. 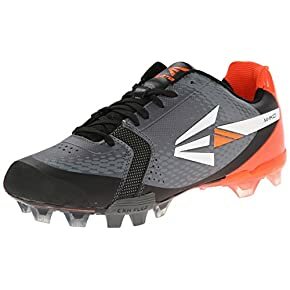 However, this traction comes at a price premium and metal cleats do not last as long as their plastic counterparts, especially if worn off the field. In addition, the excellent traction of metal cleats has been known to cause injury when players try to make quick movements and the cleat is dug into the ground. Plastic cleats are cheaper and more durable than metal cleats, but don’t provide the same traction or acceleration on the field. However, this reduced traction may be advantageous when the field is wet and muddy, since the plastic cleats will allow you to bounce over the surface of the mud rather than sink into it. Nike is known throughout the baseball world for making top-end cleats, and the Huarachi 2KFilth Pro is no exception. This metal cleat is spectacularly designed, with the most unique feature being Nike’s attention to detail in the cleat arrangement. The nine cleats are configured so as to maximize rebound off the ground and responsiveness when fielding and running. In addition, the midsole is designed using lightweight material that is both comfortable and helps reduce the weight of the shoe overall. The quick movements do not take away from the shoe’s traction, either – this shoe grips well even in muddy infield conditions. The combination of synthetic leather and heat-molded plastic allows the shoe to adjust elastically to your foot as it moves and requires little break-in. Plus, the mesh upper makes the shoe very breathable even during hot games so that your feet won’t sweat. Overall, this is one of the highest performance cleats on the market for those willing to pay the high price premium. An added bonus is that it comes in numerous styles and colors for those who like to customize their equipment. 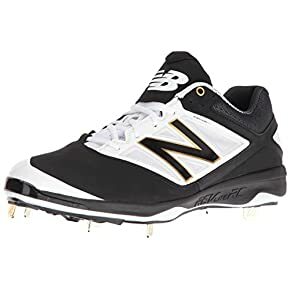 This cleat from New Balance build on their previous 300v3 cleat, and is designed to be effectively a running shoe modified with cleats on the bottom for traction when fielding. The shoe is extremely lightweight, yet comfortable thanks to the addition of a REVLite foam cushion throughout the entire sole of the shoe. This cushion layer is 30% lighter than comparable New Balance foams, so it adds little to the weight of the shoe and won’t slow you down. At the same time, it provides superior cradling for your foot and many users find this cleat to be extremely comfortable. The cleat is also designed to be highly breathable, and incorporates mesh not only into the upper but also into the sides of the shoes. While this somewhat reduces the durability of the shoes, it can make a huge difference to foot comfort during hot baseball games. Another interesting feature of this shoe is the “drive zone” at the front of the shoe, which New Balance reinforced and gave a different color in order to indicate the part of the foot that players should be pushing off from to generate power when batting or running. The 4040v3 cleat is available as a low- or mid-cut cleat – while the latter adds weight and reduces the running shoe feel, it also adds a significant degree of ankle support. If you’re looking for a cleat that will help you steal bases, the Adizero Afterburner 2.0 is the shoe for you. This cleat was designed with weight savings in mind, and Adidas went all out to make it one of the lightest and fastest cleats on the market. All of the construction materials used in the shoe are the lightest possible options available without sacrificing the lifespan and protection of the shoe. For example, the Litestrike EVA midsole was specifically designed to be lighter than the midsoles found in nearly all other baseball cleats. 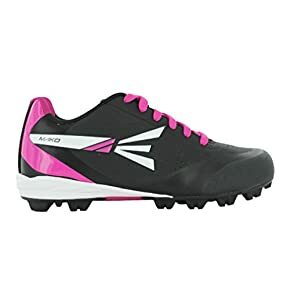 And despite leaving little material between your foot and the ground, users universally agree that these cleats are highly comfortable for hours-long games. Although these shoes only have seven cleats instead of nine – another tweak to make them lighter – these cleats still do an excellent job of providing traction when running. However, they are less adept for fielding and lateral movements. In addition, the lightweight materials tend to be more flexible across the sole, which is perfect for running but less desirable when batting or fielding. 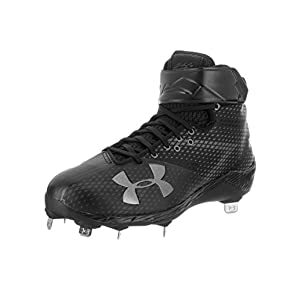 Under Armour is a late-comer to the baseball world compared to companies like Nike or New Balance, but they have made cleats that can compete. The Harper One is an excellent mid-cut cleat that boasts a single-piece synthetic construction from the saddle to the upper of the shoe. This design allows the cleat to fit like a slip-on sneaker as well as adds durability and protection for your foot. The outer layer of the shoe is mesh throughout to help with breathability. In addition, this shoe features an extremely responsive base thanks to the inclusion of a SuperFoam insole on top of a Charged Cushioning midsole. Together, these layers displace a lot of the impact energy of hitting the ground – which saves your legs energy over the course of a game – and allow you to bounce powerfully off the balls of your feet. This bounce is further accentuated by the 9-spike configuration, which is optimized for pushing off the ground while providing solid traction with each pace. Finally, the ankle strap across the top of the shoe provides exceptional support along with the high cut. What sets the Heist IQ cleat apart from competitors is the three-layer construction, which was designed with breathability in mind. 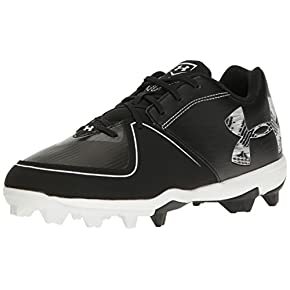 This cleat mixes synthetic leather and plastic mesh to allow heat to flow easily from the interior to the outside of the shoe, while the lack of sewed parts throughout the layering means that the shoe doesn’t sacrifice anything in durability. Inside the shoe is Mizuno’s spectacular U4ic full-length midsole, which provides a soft cushion that unlike many other midsoles won’t fade over time. Another nice feature of this shoe that is perfect for rounding the bases or fielding difficult ground balls is the flexible outsole. This flexibility allows the shoe to respond when your foot applies torque from the inside and keeps the spikes pointed into the ground, which can improve traction as you move. 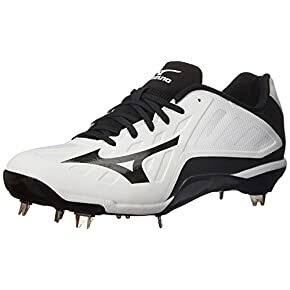 Because of this, Mizuno was able to equip the shoe with thinner than normal metal spikes that are designed with turning – either around the bases or in the infield – in mind. The cleats are available in either low- or mid-cut styles depending on your need for ankle support. The Mako cleat has a lot to offer, but its best feature by far is the full-length Cork Advantage insole. This insole provides a ton of comfort for your foot by absorbing shock and keeping pressure off the parts of your feet that can hurt by the end of a game. And it does all of this without sacrificing rebound off the ground. In addition, wearers rave about the gel pad on the bottom of the heel, which can drastically reduce pain in the foot over the course of a busy season. The polyurethane construction and mesh upper provide a degree of durability that is difficult to match with the synthetic leather found on many baseball cleats. Plus, the upper is designed to be flexible to move with your foot when running rather than put pressure against it. The major downside to these cleats is the spikes themselves. 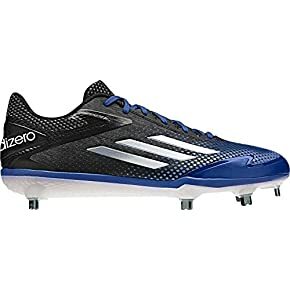 Unlike many professional baseball cleats, these shoes use plastic spikes in a V-formation and the spikes typically wear down or break off within a few seasons of use. However, as long as the cleats last, the traction they provide is comparable to many cleats with metal spikes. Mizuno brought their A-game with these softball cleats. The highlight feature of the shoe is the 9-spike outsole, which features metal spikes arranged for maximum traction whether you’re running or fielding. With these cleats, once your foot is in the ground, it’s not going anywhere without you intending it to. The full-length midsole also helps with this traction by distributing the weight of your body evenly across the base of the shoe and providing comfort against the pressure points. Plus, the shoe is designed to fit snugly around your foot so that there is no slippage on the interior, either. It achieves this with a padded “booty” tongue that snugs up against your foot and a full synthetic leather construction that requires little break-in but cinches down around your foot once the shoe is laced up. The shoe provides some breathability thank to the mesh in the upper, but overall the synthetic material used is relatively good at moving heat. Finally, this cleat is very lightweight – around 11 oz, making it one of the lighter softball cleats on the market. The Glyde RM cleats don’t provide the same traction and performance as Mizuno’s 9 Spike line of cleats, but what they lack in performance they make up for in comfort against your foot. First, these cleats use rubber spikes rather than metal spikes. This is one of the major sources of lost performance, but it also makes these shoes significantly less expensive and drastically reduces the amount of pounding that the bottom of your feet take every time they hit the ground. Second, the shoes feature a full-length Armourbound midsole that provides a significant amount of cushioning relative to the midsoles found in other softball cleats. These midsoles not only keep your feet comfortable while standing in the shoe, but also act to dampen the pressure of the spikes against your feet as you’re running and fielding. Together, this comfort can be worth the loss in performance for those with sensitive feet or who are aching by the end of the season. The shoe itself is made of synthetic leather that provides a snug fit and excellent durability, and the lifespan of the shoe is further increased by the addition of a reinforced area around the toe to protect against excessive wear. 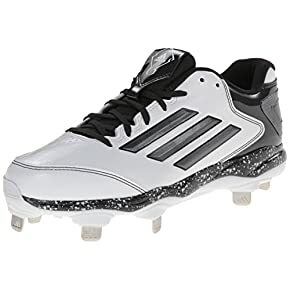 The PowerAlley cleat from Adidas was designed with reducing weight as the primary goal, and the result is one of the lightest softball cleats on the market – lighter even than Mizuno’s Swift 4 cleat. Part of the secret is the super light EVA midsole, which provides just enough comfort to keep your feet from feeling the pressure of the spikes. The midsole is reinforced with an internal shank plate, which helps to keep the shoe stable from toe to heel despite its light weight. The shoe is also constructed of thin natural and synthetic leather, which conforms to your foot tightly to enable the shoe to use less material while still providing a comfortable fit. Because the thinner material somewhat reduces the lifespan of the shoe, Adidas added a reinforced section around the toe and upper foot where the shoe typically sees the most wear during play. Another welcome feature of this shoe is the included OrthoLite Sockliner, which is designed to aid the breathability of the shoe by wicking moisture directly into the liner and away from your feet. This greatly improves how long your feet will feel dry, which in turn enhances the comfort and wearability of these shoes – especially in hot conditions. 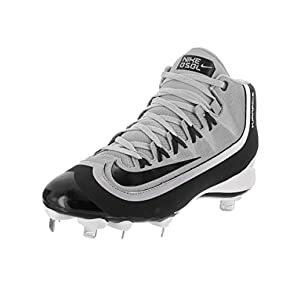 If you’re on a tight budget, or looking to invest in softball gear other than cleats this season, the HyperDiamond Strike cleats from Nike are hard to beat for the price. At less than half the cost of many competitor cleats, these shoes offer the craftsmanship (and bragging rights) that comes with the Nike brand name as well as solid performance. The shoe features a plastic outsole with nine metal cleats, so it’s certainly designed to provide solid traction on the field in all conditions. The midsole is designed for comfort and running agility, and uses a full-length Phylon pad for cushioning. The result is a lightweight shoe that is both responsive and excellent at dampening vibration back to your foot in order to reduce fatigue. 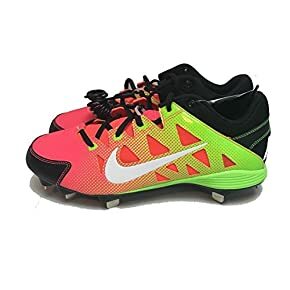 Between the lightweight midsole and the synthetic leather construction, this cleat falls on the light side for softball cleats and as such is best for players who excel at running the bases. 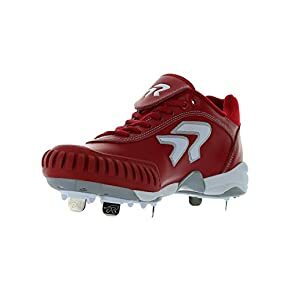 However, since it is only available in a low-cut style, this cleat is less ideal for players who find themselves frequently torqueing their ankles to field infield ground balls. The Diamond Dynasty II cleat was designed to look every bit the part of the old school softball cleat and to match the features of older style leather cleats. The outer and upper are constructed entirely of natural leather, which is excellent at conforming to your foot for ultimate comfort and unparalleled durability. In addition, the toe piece is reinforced with rubber to prevent excessive wear on this vulnerable part of the shoe. While some players swear by leather, this material does increase the price and weight of the shoe – so it may be a better choice for all-around players than for those looking to steal bases. In addition, the leather outer requires a break-in period of several weeks before it will feel comfortable around your foot and is not as breathable as synthetic or mesh construction materials during hot weather. The midsole incorporates a full-length EVA foam pad, which provides plenty of comfort underfoot and protects against pressure from the spikes. Finally, the cleat features nine metal spikes, making it a great choice for traction performance on the field. 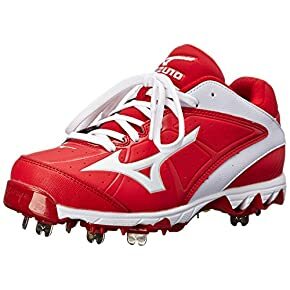 If you’re not fully committed to softball or don’t want to spend a large sum of money on cleats, the Mako Wos are a great budget choice that can serve as a stepping stone towards a more advanced cleat. First, the cleat uses rubber spikes rather than metal spikes. The rubber spikes typically provide less traction, but may be easier for new softball players to navigate without tripping and place less pressure on the feet. In addition, the midsole is plush to make the shoe feel more comfortable, similar to a traditional sneaker rather than a softball cleat. The low-cut style does not provide much ankle support, which can also be more comfortable for less experienced players as it is more akin to sneakers and running shoes. The shoe is constructed from polyurethane rubber for the outer and upper, and unfortunately has little built-in mechanism to allow heat to escape. As a result, this shoe is relatively uncomfortable for season-long use during the summer. In addition, the rubber is durable enough for one season, but is unlikely to last much longer than that. Small changes in performance can make a huge difference in the outcome of a baseball game, so it’s important to give yourself every advantage you can on the field. That starts at your feet, by having the right pair of cleats to keep you moving as fast as possible without risking ankle injuries. Now that you know how to choose a pair of cleats and know which models are among the best baseball cleats available, you’re ready to get out on the field and inch your team closer to victory.